Just because there is snow doesn’t necessarily mean it will be freezing cold. It can even be quite warm if you are snowshoeing in the springtime on a sunny day. However, you can also end up, even in Spring, with bitterly cold, sub zero temperatures, blizzards and a significant wind chill factor! So if you are packing for a snowshoeing holiday it can be difficult to decide what essentials to put in your bag - especially if you are trying to fit it into hand luggage!! However, there are some general rules of thumb that apply to all snowshoe walks! Choose comfortable walking socks that are good at wicking away sweat but also warm. Your feet will be in snow, which, for it to be snow, is at least 0 degrees centigrade. Any warmer and it's puddles. Socks with some wool content are good. Snowshoes have plastic or webbing attachments that strap onto your walking boots. To avoid rub spots, it is important that your walking boots are relatively stiff and sturdy boots with good ankle support. Walking trainers will not do! To save weight in your baggage, wear your walking boots on the plane and pack your lighter evening shoes or slippers in your bag. As you are walking in snow, it is imperative that your boots are waterproof and breathable. The last thing you want when snowshoeing is wet feet – they will get very cold and uncomfortable. On the subject of wet feet it is important to stop snow from getting into your boots. Gaiters are an essential snowshoeing item as they create a waterproof seal over the tops of your boots, right up to your knees! When you are snowshoeing you will generate body heat and sweat. However, as soon as you stop, the cold outside temperatures will cool you down very quickly. To be able to adapt to these changes of temperature quickly you should use a layering system. 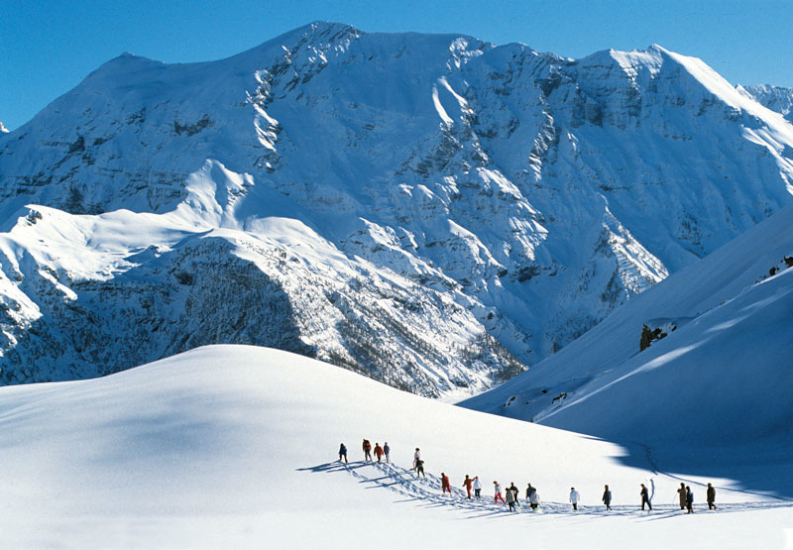 The objective when you are snowshoeing is to try to avoid too much sweating by taking off outer andthick layers and choosing thinner, more breathable layers for uphill sections or if you are gong to be excerting yourself more than usual. Try to anticipate when you need to strip down to thinner layers, for example, just before you start a big uphill section. Once you are already hot and sweaty it is too late. The cool outside temperatures will cool down the humidity in your clothes very quickly and that is what will make you feel cold. Similarly, when your rhythm changes and you can feel or anticipate that you will start to cool down, put on a warmer layer. When you stop, your body stops generating heat as effectively as when you are on the move so you need to optimise what is already there before it cools down or the wind blows it away and put on thicker layers and a wind stopper. You should do this whilst you are still warm. Once you are cold it is very difficult to warm up again! Wool or wicking thermals, a thin and thick fleece and a duvet jacket (that can stuff into a small bag) are perfect with a waterproof shell for windy or wet weather. If it is snowing, it is best to take off mid layers and keep your waterproof shell on if you are warm. If it is dry, you are best wearing easily breathable layers like your fleeces so you don’t accumulate sweat. For legs, you probably won’t need waterproof trousers unless it is a wet or snowy day, but it is good to have a pair of over trousers in your bag for if the weather changes. A good pair of warm walking trousers or fleece leggings are perfect as they will allow your legs to breathe. The majority of our body heat escapes through our head and neck. Having a choice of hats is great for helping to get your temperature right. A thick warm windproof hat, a fleece hat and a thinner buff that can also double as a neck warmer are a good combination. Your hands should always be covered when snowshoeing as a fall on icy snow can burn naked skin and your hands will be the first victims. As with hats, a pair of silk or thin under gloves, a pair of fleece gloves and over mitts or thicker ski gloves are a good combination. If you have gloves with grips on them, they will be more comfortable and less slippy for holding the poles. It is always worth having a spare pair of fleece gloves in your bag for if they get wet. Have a look at Undiscovered Mountains’ snowshoeing kit list for ideas on what to pack for a snowshoeing holiday and check out all our snowshoeing holidays in Europe for holiday inspiration!